ARICK McLAWYER rushed for 191 yards as Huntington Beach defeated rival Marina 32-7 at Cap Sheue Field earlier this year. The Oilers will take on Edison this Friday in a Sunset League battle. (Orange County Tribune photos by Christopher Abdelmalek). League play has now started for almost every high school football team in the area. It’s a trifle early to start handicapping the way the league races will turn out, but there are some interesting potential showdowns down the road. The Garden Grove League looks wide open, but Loara is emerging as the slight favorite, in this, the Saxons’ first year in the GGL. Four of the six teams are at 3-3 overall. 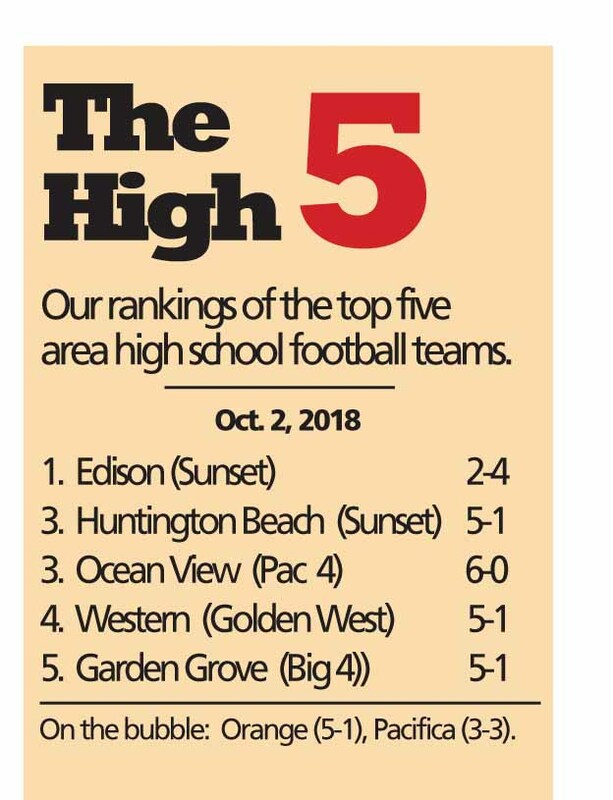 In the Sunset, Los Alamitos looms over everyone, but if anyone has a shot at overturning the Griffins it could be Fountain Valley, or even a resurgent Huntington Beach team. Don’t count out Corona del Mar. The new Pac-4 is loaded with talent, with Ocean View at 6-0 and Laguna Beach and Western each at 5-1. In the Empire, Pacifica has a shot at repeating last year’s co-league championship; the Mariners looked impressive in smacking Cypress last week. Another new league, the Big-4, looks to be a showdown between Segerstrom and Garden Grove, each with just one loss so far. Katella (6-0) is the clear favorite in the Orange League. In the Orange Coast League, Orange is the favorite but Santa Ana and Estancia will contend. Some outstanding stats and stat-makers from last week’s area high school football games. Braeden Boyles (Edison) passed for 163 yards and two touchdowns against Corona del Mar. Michael Lee (Rancho Alamitos) passed for 139 yards and one TD against Santiago. Anthony Munoz (Western) passed for 453 yards and five scores against Garden Grove). Mike Carrillo (Garden Grove) rushed for 233 yards and three TDs vs. Western. 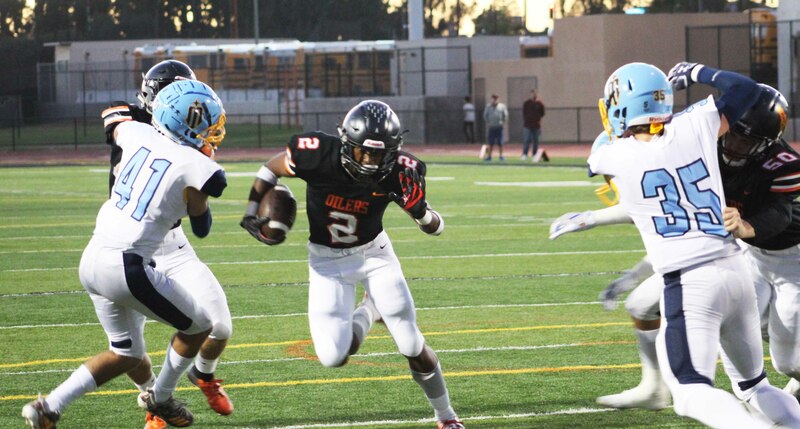 Arick McLawyer (Huntington Beach) rushed for 102 yards against Newport Harbor. Here are the matchups for this week’s area high school football games. We like the Huntington Beach-Edison matchup on Friday. As always the games, times, locations, etc. are subject to change without notice. Call ahead. Crean Lutheran (4-2 overall, 0-1 in league) at Pacifica (3-3, 1-0). Bolsa Grande (1-5, 0-1) at Santiago (3-3, 0-1)) at Monsoor Stadium. Garden Grove (5-1) at Laguna Hills (2-4). Edison (2-4, 0-1) at Huntington Beach (5-1, 1-0). La Quinta (3-3, 1-0) at Loara (4-2, 1-0) at Glover Stadium. Los Amigos (3-3, 1-0) at Rancho Alamitos (3-3, 1-0) at Bolsa Stadium. Savanna (5-1, 1-0) at Magnolia (2-4, 1-0) at Handel Stadium. Costa Mesa (0-6, -01) at Orange (5-1, 1-0) at Fred Kelly Stadium. Marina (2-5) at Segerstrom (6-1). Western (5-1) at Artesia (4-2). Cerritos (3-3) at Ocean View (6-0). North pole, south pole, CIF polls …. Local appearances in the latest CIF-SS polls for fall sports are here, rankings released on Monday afternoon. Division 6: Huntington Beach is ninth. Division 9: Orange is fourth; Garden Grove is seventh. Division 11: Western is first, Ocean View is second. Divisions 1 and 2: Huntington Beach is seventh. Division 5: Los Amigos is seventh. Division 7: Rancho Alamitos is fourth. Division 4: Ocean View is 10th. Division 7: Ocean View is third. Division 3: Garden Grove is fourth. Division 4: Bolsa Grande is unranked but received some votes.